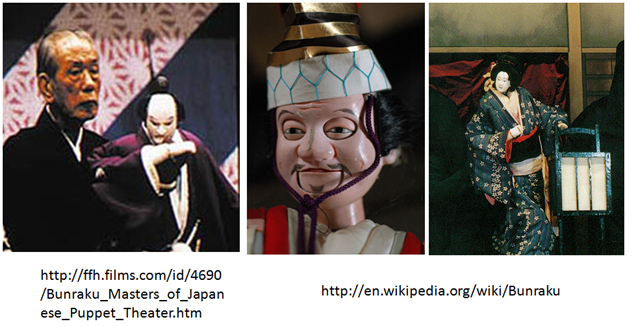 If art tends to exaggerate the gestures, emotion and the intensity of feeling to capture the attention of its audience, to focus it on the point of artist’s expression, then Japanese Bunraku takes exaggeration to new heights by combing the collectivism of three artists and one specially crafted puppet. The end-result is a harmonic blend of fluid movement of the puppets, words of the off-stage readers, and the shamisen music from the highly accomplished players. I had read that the puppet masters are so skillful that the audiences soon forget their presence , but I was not prepared for the surprise when I saw a live performance in Tokyo twenty years ago. The exaggerated movements of the eyes, eyebrows, mouth, hands and fingers in stylized gestures create a heightened sense of reality in which the puppet and the puppeteers become one and the words and the music blend with the scene to transport the viewer into a surreal world of exquisite emotions dealing with ninjo and giri . Ninjo refers to raw human feelings or human nature not influenced by cultural norms or obligations. Giri represents individual’s obligation to others based on inter-personal give and take relationships. Social harmony that is the essence of collectivism is promoted by encouraging giri to supersede ninjo when a conflict occurs between an individual’s feelings and obligations to others. The themes of Bunraku capture vividly the conflict between one’s human emotions (such as love, compassion, greed, revenge, jealousy, and anger) and one’s obligations to others in the group. Ninjo is the equivalent of the Keynesian concept “animal spirits”  whereas giri represents regulation and control whether it originates from within the self or imposed from outside. While the older generation of Japanese nostalgically lament the loss of Tokugawa era values with western influence and the emphasis on individualism, some of the younger generation, dismiss Giri and Ninjo as old feudal concepts that are no longer relevant. Twenty years ago, a Japanese colleague from Fujitsu, who came to see Bunraku with me, admitted that it was her first time to see Bunraku live, and was very pleasantly surprised at the impact the performance had on the viewers. In any case, content aside, the practice and performance of the puppeteers and the puppets of Bunraku display exquisite motions and emotions that capture the attention of the audience. The perfect timing of the three puppeteers making the emotions come alive such as a woman sobbing with a handkerchief, a villain displaying astonishment, fury and anger using eyebrows, takes years of practice and dedication. The institutional knowledge is preserved in the continuation of the practice of the art through the support of National Theaters. The Japanese government recognizes the dedication and sacrifice of the practitioners by giving the title “living national treasures” to the masters under Japan’s program for preserving its culture, harmony and the power of institutional knowledge. The Bunraku masters depict a culture that values the importance of the human element, synergy of the group, cross-functional coordination through intimate communication, patience, and a balance between individualism and collectivism with a bias toward collectivism. These values also were carried into social, political and business culture and formed the foundation for the Japanese uniqueness that served them well in becoming the number two global economy. 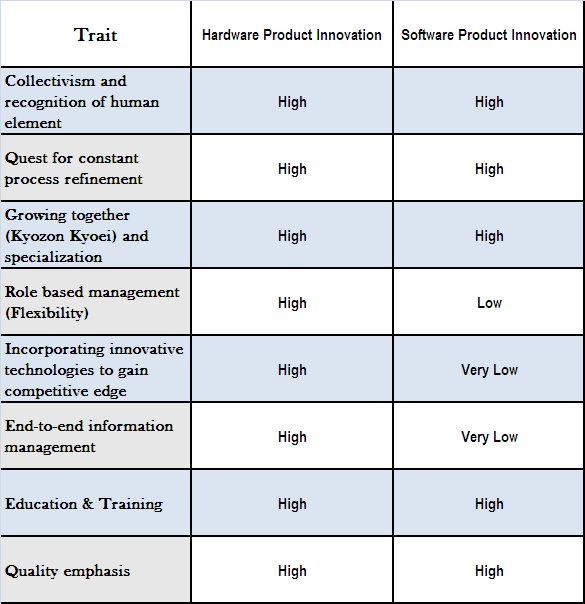 Twenty years ago, when I was doing research for my master’s thesis at Sophia University, Tokyo, on the subject “Is Japanese Software Thrust as powerful as their Hardware Thrust?”, I was surprised at the role the cultural traits played and equally surprised at the recognition of their importance by the senior Japanese management that I interviewed. All of them agreed with my conclusions summarized in Table 1 . Two of these traits were taken to new heights by Toyota and other Japanese companies in their manufacturing process. Quest for constant process refinement led to the perfection of Quality Function Deployment and House of Quality. Toyota also used end-to-end information management to track various components that are part of an automobile from cradle to grave. They used it in their testing processes. They used it to track their automobile whereabouts globally and knew when they were due for maintenance etc. “I learn all the time, but I don’t think I’ll finish developing as a human being. One of my main functions now is growing other Americans to follow that path. They call it the DNA of Toyota, the Toyota Way and TPS – they are all just very integrated.” With this statement, Gary Convis , the first American president of Toyota sounds more like a Bunraku master than an American business executive. “I have been considering the rapid growth in our manufacturing and marketing operations. And I have been eager to keep management decision-making close to our customers. We need to be where we can hear directly from our customers. That will enable us to incorporate customer feedback swiftly in research and development and, as necessary, in hands-on measures in the marketplace, including product recalls. “In the past few months, our customers have started to feel uncertain about the safety of Toyota’s vehicles.” He says he takes “full responsibility” for that fact and goes on to blame the company’s problem on its decision to pursue growth too aggressively. “We pursued growth over the speed at which we were able to develop our people and our organization, and we should sincerely be mindful of that,”. Global expansion coupled with a cultural incongruence between Japanese emphasis on the “Way” and the western tendency toward “profit at any cost” individualism have resulted in what Toyoda called the inability to “develop the people and the organization” to meet the fast growth rates demanded by short-term profit motives with same quality. End-to-end information management systems seem to have not kept up pace with global growth and the result is a communication failure between those who are close to their customer and those involved in Research & Development. A third factor, that is not so clear-cut, is the increasing role of software in the automobile itself. As the automobiles have become more software dependent to control the efficiency and performance, software innovation, its development process and its quality control play an ever-increasing role in the overall quality of the automobile. In the past, the cultural traits that have served well in developing Japanese hardware prowess were not utilized so well in developing the software prowess. Twenty years ago, Japanese engineers and their management were slow in bringing innovation in software technologies into their products and were not able to deal with the fluidity of software requirements. With this remark, almost twenty years ago, I concluded (in my thesis submitted as JMP-17 student at JAIMS, Japan American Institute of Management Science, Hawaii and Sophia University, Tokyo) that the Japanese business leaders in general and Fujitsu top managers in particular were poising themselves to play a bigger role in global software market. Twenty years is a long time. The role of software has increased in every aspect of human life. Today, we communicate, collaborate and engage in commerce at the speed of light with myriad software systems helping us. Automobiles today have more software controlling them than the humans who drive them. Cultural traits have changed along with globalization and commerce at the speed of light. Space and time boundaries have blurred. Japanese companies today are influenced heavily by western risk addicted, “profit at any cost”, business executives. Sony is no longer a technology innovation company. It has transformed itself to being a risky entertainment company managed by a western executive. Increasingly, western business practices have changed the global Japanese companies. Global competition for market share in a crowded automobile market and a stock market which, measures share holder value by the minute through a casino like trading operation, force rapid growth at any cost. From Toyoda’s testimony, Gary Convis’s passion and beliefs seem to be different from those of Toyota’s management in charge of operations today. Obviously, Gary Convis was not successful in passing on the mastery to his successors like the Bunraku masters were. 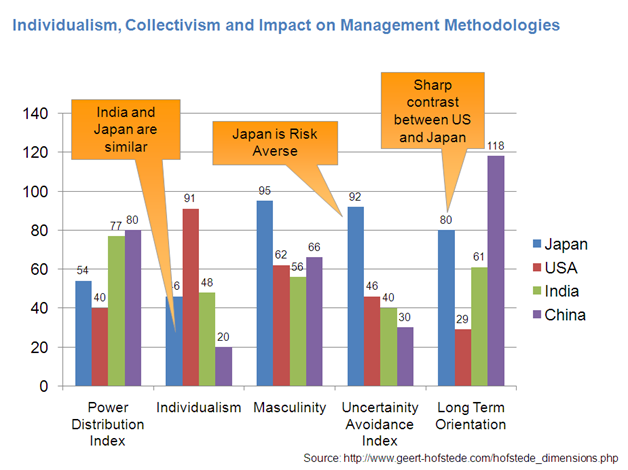 What is the role of cultural traits today in business management? Have globalization and the quest for communication, collaboration and commerce at the speed of light normalized the cultural values across the globe? Is there still a difference between Japanese hardware and software prowess today? This is the topic of my research and I invite anyone with appropriate insight to participate in an update to my thesis of almost twenty years ago. 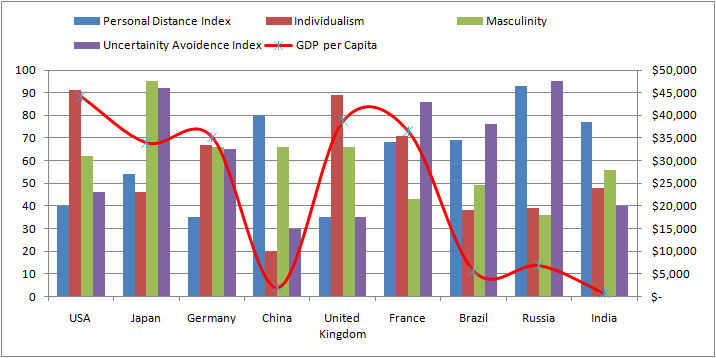 Despite controversy, extensive data gathered by Geert Hofstede  still is valuable in gaining some insights into the role of cultural dimensions. In my recent discussions with some of the Japanese senior managers from large IT infrastructure companies in Japan, most people agreed with the three observations highlighted in the figure above. If these hold true with a larger sample, how will these observations translate into management lessons in a global context where space and time boundaries are being blurred? Are these cultural dimensions important in understanding the nature of Indian and Chinese business practices? Will they explain why many high-profile American business managers and investors preferred selling dubious financial instruments to unsuspecting Icelanders instead of building energy-concious automobiles? Will they explain the lack of corporate conscience or perhaps the corporate schizophrenia of drug companies like Pfizer which results in knowingly marketing drugs like Baxter and Cerebrex while at the same time introducing other miracle cures? Food for thought! One can draw one’s own conclusion.